We’d love your help. Let us know what’s wrong with this preview of Water Storage by Art Ludwig. A do-it-yourself guide to designing, building, and maintaining water tanks, cisterns and ponds, and sustainably managing groundwater storage. It will help you with your independent water system, fire protection, and disaster preparedness, at low cost and using principles of ecological design. Includes building instructions for several styles of ferro cement water tanks. To ask other readers questions about Water Storage, please sign up. Gave me many things to think about in regards my own water system. Thank you, Mr. Ludwig. Astonishing amount of practical, comprehensive content packed into 125 pages. 2. There is balanced coverage of convenient systems common in industrialized parts of the world and lower tech time-tested systems in use in less wealthy parts of the world to give designers a broader range of possibilities in terms of cost Astonishing amount of practical, comprehensive content packed into 125 pages. Are you surprised that this book is boring? It was an okay book, but I was expecting something that would appeal to a broader audience (the cover to me looks like the books for DIY'ers. But (as another reviewer said) I was disappointed that it focused so heavily on dry desert regions. And with the bright cover, I was surprised that the inside was black and white...It was kind of technical and though it had a tid-bit here and there that I liked, I feel like there has to be better books out there that covers water storage. It was an okay book, but i was expecting something that would appeal to a broader audience. I did come away with a couple of good nuggets of info, but I was disappointed that it focused so heavily on California and Mexico. Again, it could have had a broader focus and less technical lingo. If the author had written it to be useful by more of us without engineering degrees, it might have been more helpful. I can't decide whether to give Water Storage four or five stars. It's excellent, but doesn't cover any form of storage other than tanks in any depth. Excellent manual, well written clear descriptions. Good intro book but not comprehensive, so you will have to supplement with info from other sources. Can't say I liked this book as literature, but rather for the information it provides. 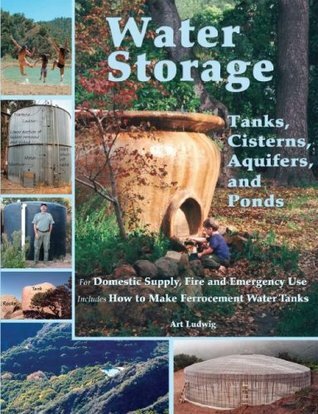 Excellent book on how to build water storage devices. I was very pleased with it. Art Ludwig is an ecological systems designer with 35 years full-time experience in water, wastewater systems, energy, shelter and human powered transport. His specialty is complex, integrated "systems of systems." Art has studied and worked in 27 different countries, attaining fluency in 5 languages. He has consulted for the states of New York, California, and New Mexico on water reuse policy and Art Ludwig is an ecological systems designer with 35 years full-time experience in water, wastewater systems, energy, shelter and human powered transport. His specialty is complex, integrated "systems of systems." Art has studied and worked in 27 different countries, attaining fluency in 5 languages. He has consulted for the states of New York, California, and New Mexico on water reuse policy and building codes, and given dozens of lectures and workshops. He has developed numerous innovations which have been adopted worldwide, incorporated in building codes, etc., all of which he has published into the public domain. These include the Laundry to Landscape and Branched Drain greywater systems. He designed his own education in Ecological Systems Design, graduating from UC Berkeley. At Berkeley, he developed the first cleaners specifically designed to be biocompatible with plants and soil, and founded a successful business to manufacture and distribute them. Art has authored numerous articles as well as the books "Water Storage" "Principles of Ecological Design," and "Create an Oasis with Greywater."